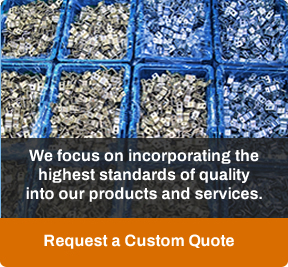 Winzeler Stamping Company manufactures various products made from brass strip and rod. The table below outlines the lead content of the materials used. Our brass mill certifies that both alloys (C260 and C268) contain a maximum lead content of 0.05% lead. Based on that certification, the maximum lead content in Winzeler Stamping Company’s stamped brass product is 0.05%, which equals 500 parts per million by weight. Some of our heavy-duty hose couplings components are machined from rod brass. While some of the alloys above have a lead content that is equal to or greater than 0.25%, the components made from these materials do not come into contact with water in garden hose applications. Only products made from C260 and C268 brass strip contact the water directly and have a wetted surface. Effective January 4, 2014, the Safe Drinking Water Act replaced their NSF Standard Annex G with NSF Standard 372 and defines “Lead Free” as not exceeding 0.25% lead content for wetted surfaces. The Standard focuses on potable water and products used to convey water anticipated for human consumption. Most garden hoses are not intended for potable water and specifically warn consumers not to drink from them. Most manufacturers produce specific “Drinking Water Safe” hoses that are labeled as such. NSF Standard 372 has a lead requirement equal to California’s Proposition 65. Our garden hose coupling products have been tested by NSF and found to be compliant with California’s Prop 65. To download a copy of our statement regarding Winzeler brass products and lead contact, please click here. As of January 4, 2014, the "Reduction of Lead in Drinking Water Act" (or Senate Bill S.3874) is the federal standard for the level of permissible lead in plumbing fixtures that carry water for human consumption. The allowable lead content in products providing water for human consumption changes from up to eight percent to an average content of less than 0.25%. The new bill aligns the allowable lead levels in all 50 states with the levels mandated in the previously enacted legislation in California and Vermont. The law does not necessarily prohibit the use of components containing more than 0.25 percent lead, but rather defines a calculation to determine the lead content of the average wetted surface in the product. It is this average wetted surface that must contain less than 0.25 percent lead. Wetted parts include meters, expansion tanks backflow preventers, flexible connectors, strainers, and assorted gauges, fittings, valves, etc. – any product used to convey water anticipated for human consumption. Wetted components for nonpotable services such as manufacturing, industrial processing, outdoor watering, or toilets are exempt from the standard. AB 1953 is the designation assigned to the California Assembly Bill that was to revise Section 116875 of the Health and Safety Code, relating to lead plumbing. 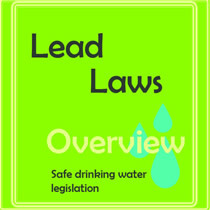 This bill was signed into law on September 30, 2006, and revises the meaning of the term "Lead Free." The percentage of lead content within each component that comes into contact with water shall be multiplied by the percent of the total wetted surface of the entire pipe and pipe fitting, plumbing fitting, or fixture represented in each component containing lead. These percentages shall be added and the sum shall constitute the weighted average lead content of the pipe and pipe fitting, plumbing fitting, or fixture." The Vermont bill regulates lead in consumer products similar to the California Lead Plumbing Law which also prohibits the sale of plumbing fixtures whose wetted surfaces contain more than a weighted average of 0.25% lead effective January 1, 2010. The term "plumbing fixtures" is defined as pipes, pipe, plumbing fittings and fixtures used to convey or dispense water for human consumption. a) "No person shall use any pipe, pipe or plumbing fitting or fixture, solder, or flux that is not lead free in the installation or repair of any public water system or any plumbing in a facility providing water for human consumption, except when necessary for the repair of leaded joints of cast iron pipes." b) "No person shall introduce into commerce any pipe, pipe or plumbing fitting, or fixture, that is not lead free, except for a pipe that is used in manufacturing or industrial processing." For the purpose of prohibiting certain plumbing materials containing more than a certain amount of lead from being used in the installation or repair of plumbing intended to dispense water for human consumption; prohibiting the sale of certain plumbing materials containing more than a certain amount of lead; requiring the State Board of Plumbing to adopt certain regulations; defining certain terms; providing for a delayed effective date; and generally relating to the lead content of materials used in plumbing. This Act shall take effect January 1, 2012. § 12-101 (H-1) “Lead-free” means: (1) Containing not more than 0.2% lead for solder and flux; (2) containing not more than 8% lead by dry weight for pipes and pipe fittings; and (3) containing a percentage of lead for plumbing fittings and fixtures that is in compliance with standards established under 42 U.S.C.A. § 300g–6(e) of The Federal Safe Drinking Water Act; and (4) containing not more than a weighted average lead content of 0.25% for the wetted surfaces of a pipe, pipe fitting, plumbing fitting, or fixture intended to dispense water for human consumption through drinking or cooking. In December 2008, NSF/ANSI Standard 61 was revised to add requirements to the standard allowing manufacturers the option of being certified to a lead content standard in jurisdictions with a 0.25% weighted average lead content requirement. With the adoption of the new Federal Standard, Annex G will be replaced by NSF/ANSI 372. NSF/ANSI 61 will remain to determine the level of many different contaminants in water. Lead is one possible listed contaminant to be tested for.